Ole! Our fieriest south-of-the-border cheddar yet! Attention-grabbing habaneros offer a ride-'em cowboy, yi-ha, blazing taste experience. Not for the timid! 1. In medium bowl, combine black-eyed peas or black beans, oil, lime juice and cumin; mash coarsely with potato masher (mixture should hold together but some beans should still be visible). 2. Gently stir in cheese; taste and season with salt if needed. Serve in bowl or bell pepper shells, surrounded by oven-crisped triangles of tomato or spinach flatbread or crackers. Use this in cooking. Would caution it is much spicier than expected. 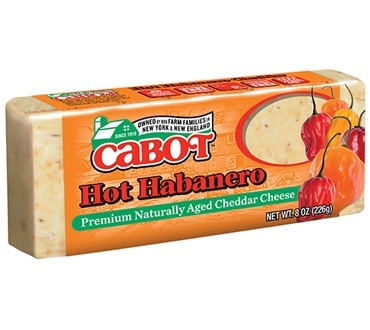 This is by far the best habanero cheddar! Great cheese with a great spicy kick!! I totally love it!! If you like spicy with a fantastic cheddar flavor......this is for you! This is by far the best spicy cheese I have ever eaten. The local grocers that I bought it from quit selling it ( and I asked the manager why!!) So I found it on line and purchase it myself. You ask why......well....taste it! Very good cheese with some heat, not overwhelming!